Thunderkick doesn’t release a lot of new slot games a year, so when they have a new game out, I am interested. 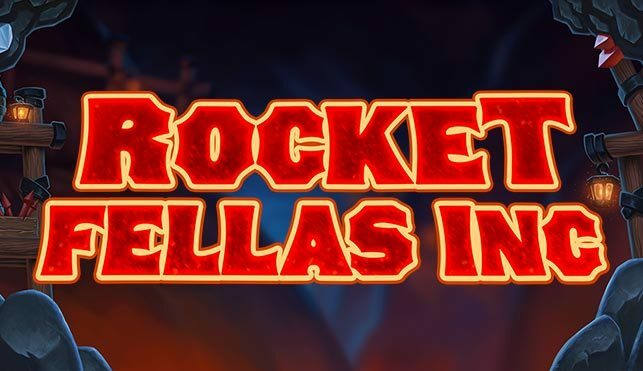 And they have released a new title now, Rocket Fellas Inc. Rocket Fellas Inc uses like a miners and TNT type theme, with dwarfs and explosives. The game uses 30 lines on 5 reels, 4 symbols high. All symbols can appear stacked on all reels, except bonus symbols. Wild symbols don’t appear on the reels, but the barrel symbol can become wild. On reel 1 one or more rocket symbols may appear, every barrel that appears on the same row as these rockets will become wild, including the rockets themselves. During free spins each wild symbol that is created will become a wild symbol and will stay on the reels for the remaining free spins. The reel that has a sticky wild symbol will become a hot reel. This means that all barrel symbols appearing on this reel will turn wild automatically, even if there are no rocket symbols. These wild symbols won’t become sticky, only wild symbols created by rockets will become sticky. 2, 3, 4 or 5 scatter symbols during free spins will award 3, 10, 15 or 20 extra free spins respectively. Rocket Fellas Inc is a good-looking game, with bright colors and a great soundtrack. The bonuses are unique and this game can really pay out some nice wins because of the sticky wilds and all stacked symbols. Check out Rocket Fellas Inc at Videoslots or Casumo. And be sure to check out the gameplay video below.